Let’s take a break from the online slots for a few minutes and check out something a little different from a smaller developer called Dynamite Idea. Roulette fans may by interested in having a crack at Fortune 36 – it’s like a modernised versions of that famous game but slightly simpler at the same time. The name ‘Fortune 36’ refers to the numbers on the board as you can see from the screenshot above. In fact there are of course 37 numbers if you include the zero in the total. As with roulette, that zero can mess up your betting strategies so beware. 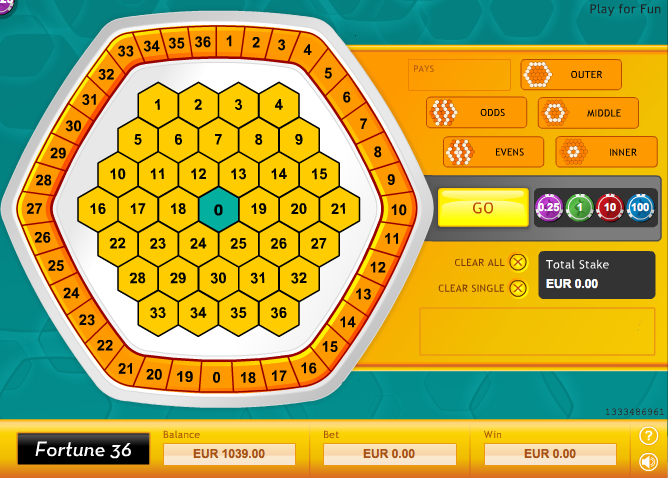 The left of the screen is occupied by the number board and on the right hand side you can see the various betting options available, along with the chip sizes. The first thing to do is decide what you would like to bet on; the choices are odd numbers, evens or a selection of the rings – inner, middle and outer. The odds differ for the rings because they contain different amounts of numbers – the inner rings has just six while the outer ring has eighteen. You can also place a bet directly on single numbers or groups of numbers by placing the chip on the line between those numbers. Of course you can place any number of bets on various combinations. When you’ve finished distributing your chips, just press the ‘Go’ button and you will see a light zoom around the outer ring. At the same time it will skip around the matching numbers on the inner area. When it lands, any wins for you will be awarded and the process begins again. Fortune 36 is one of those games where it’s possible to experiment with betting strategies such as the Martingale system. Ultimately of course all such strategies are doomed but you can have some fun trying. This is a pleasant enough diversion if you’re looking for an alternative to roulette and it’s simplicity makes it quite attractive. It’s ideal for trying out those strategies.